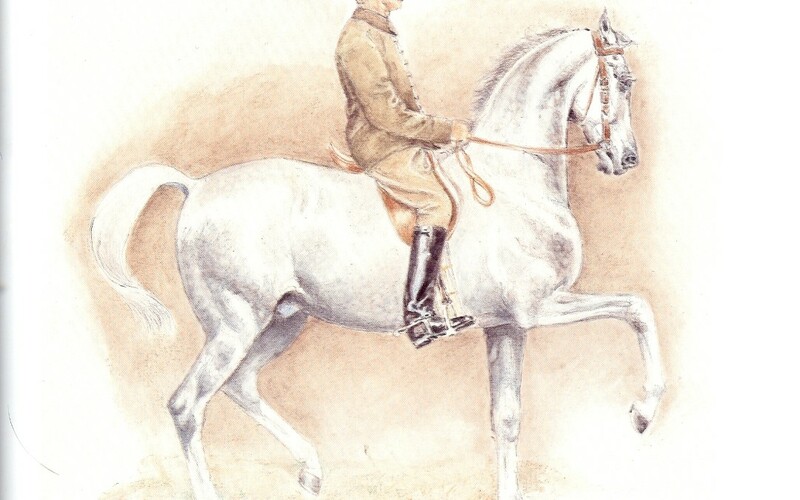 Classical dressage is founded in the teachings of the ancient Greeks. Particularly, but not limited to the teachings of Aristotle and Plato. In everything including working with the horse, a horseman worked always with the the four cardinal virtues as the ground of all training and the aids. It is right reason in action. It is the foundation of all the other virtues. It establishes rule and measure in any situation with the horse. Skillful means arises from wisdom. It is seeing what is and acting or not as needed. Wisdom sees the horse as a being who is our physical superior in every way and knows how to engage our intelligence to improve its situation. Justice toward ourselves and the horse disposes one to respect the rights of the horse and to establish in the relationship the harmony that promotes equity with regard to both beings. It understands that there is at the heart of any relationship a common good. In good dressage, the perfection of the seat is the greatest justice from which just aids arise. Dressage presents a range of difficulties in both learning and practice. Fortitude is the strength or firmness of mind that enables a person to encounter difficulties and danger with coolness and courage. The assumption many times is strength is hard and aggressive but real strength is the source of all kindness,. Only the strong can be gentle. In modern thinking the term temperance is what ensures the will’s mastery over instincts and keeps desires within the limits of what is honorable. The temperate person directs the sensitive appetites toward what is good and maintains a healthy discretion. In the thinking of the old masters it was more. It was the proper mixture or proportion of elements or qualities; especially: the combination producing the desired state in the horse. this balancing of the 5 elements (earth, water, fire, air and space) provide the ground for all training. Please keep in mind that this very short mention of the virtues is only a way of drawing attention to the modern lack of them in the working of dressage. No dressage has any classical foundation unless it considers these four virtues. It is also useful to consider that each of the virtues have both masculine and feminine attributes. I mention this because in modern western thinking, there is a tendency to consider only the male side to be of value, when in fact, one must be attentive to balancing both attributes. All classical work of any value is light and gentle. Harmony is not the end result of some training ritual. Harmony is the start, middle and end of all training. The only way the horse is dominated is by kindness and gentleness. All these virtues arise out of kindness and kindness is the source of all the virtues. The horse is both magical and sacred and then must never be considered a dumb animal. If there is a dumb animal present in training, you can be certain that it is not the horse. Here is a simple guide pointing toward to good dressage and classical work.